Our medium to heavy duty stainless steel casters feature a 100% washable design with #304 stainless steel construction throughout the entire caster, including the 1/2" precision kingpin and 1/2" axle and lock nut. Also feature a double stainless steel ball bearing raceway, with grease seals in the upper raceway. 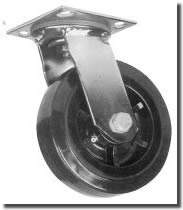 Stainless steel casters in series 30 are available with optional WB Cam Brake. Polyolefin 450 NCC-SS30S420-POR 5.08 NCC-SS30R420-POR 3.83 "
4" 2 Polyurethane on Polyolefin 600 5-5/8 NCC-SS30S420-PPUR 3.98 NCC-SS30R420-PPUR 2.83 "
Solid Polyurethane 700 NCC-SS30S420-SPUR 3.98 NCC-SS30R420-SPUR 3.98 "
Rubber on Polyolefin 400 NCC-SS30S420-TPRR 3.98 NCC-SS30R420-TPRR 2.83 "
Cushion Polyurethane on Polyolefin 800 NCC-SS30S420-SCR 3.98 NCC-SS30R420-SCR 2.83 "
Polyolefin 650 NCC-SS30S520-POR 4.82 NCC-SS30R520-POR 3.19 "
5" 2 Polyurethane on Polyolefin 750 6-1/2 NCC-SS30S520-PPUR 4.82 NCC-SS30R520-PPUR 3.19 "
Solid Polyurethane 1000 NCC-SS30S520-SPUR 4.82 NCC-SS30R520-SPUR 3.19 "
Rubber on Polyolefin 450 NCC-SS30S520-TPRR 4.82 NCC-SS30R520-TPRR 3.19 "
Cushion Polyurethane on Polyolefin 750 NCC-SS30S520-SCR 4.82 NCC-SS30R520-SCR 3.19 "
Polyolefin 700 NCC-SS30S620-POR 5.08 NCC-SS30R620-POR 4.06 "
6" 2 Polyurethane on Polyolefin 900 7-1/2 NCC-SS30S620-PPUR 5.08 NCC-SS30R620-PPUR 4.06 "
Solid Polyurethane 1200 NCC-SS30S620-SPUR 5.08 NCC-SS30R620-SPUR 4.06 "
Rubber on Polyolefin 550 NCC-SS30S620-TPRR 5.08 NCC-SS30R620-TPRR 4.06 "
Cushion Polyurethane on Polyolefin 900 NCC-SS30S620-SCR 5.08 NCC-SS30R620-SCR 4.06 "
Polyolefin 800 NCC-SS30S820-POR 5.5 NCC-SS30R820-POR 4.5 "
8" 2 Polyurethane on Polyolefin 1000 9-1/2 NCC-SS30S820-PPUR 5.5 NCC-SS30R820-PPUR 4.5 "
Solid Polyurethane 1200 NCC-SS30S820-SPUR 5.5 NCC-SS30R820-SPUR 4.5 "
Rubber on Polyolefin 700 NCC-SS30S820-TPRR 5.5 NCC-SS30R820-TPRR 4.5 "
Cushion Polyurethane on Polyolefin 1000 NCC-SS30S820-SCR 5.5 NCC-SS30R820-SCR 4.5 "